All our best hair care advice for this summer! It's summertime! Swimwear, sun, sand and the sea... take care to mind your hair while you unwind this summer! Stay looking your best and take our advice to protect, repair and make your hair stand out this season. Prepare yourself to be the beach beauty this summer! 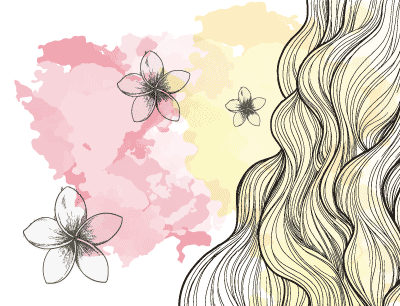 Discover our 3 essential steps to protect and care for your luscious locks to get that goddess-like hair this summer. 1 - Protect Your Hair! Remember that if your skin doesn't handle UV rays that well, then your hair doesn't take too kindly to it either! These rays actually make your hair fibres porous and effectively dry them out and damage your main hair constituant, keratine. As a result, your hair becomes more sensitive and can't repair itself. Salt and chlorine also dry out your hair, and since a shower cap isn't exactly beach couture, it's important to have your own ritual prep as well as the right adapted suncare so you don't end up with dreaded 'straw' hair at the end of summer. These treatments form a screen to protect your shine and keep your hair from getting dehydrated thanks to their special UV filters. • Before heading out into the sun, apply an adapted suncare treatment to your hair. With oils and protectors sprays out there, you will definitely find something suited to your needs. • For the beach, opt for a non-greasy spray to get maximal hair fibre protection. If you have an appetite for water activites, make sure to choose a product that gives you protection from both salt and chlorine. • Just like sun cream, be sure to re-apply every two hours. If you have dry and brittle hair, you should try a more oily treatment to hydrate and protect your hair. Very high protection dry oil for sensitive skin against UVA and UVB rays. Dry oil protection for sensitive skin against UVA and UVB rays. Ideal in the summer, this fluid protects your hair against ultraviolet rays during exposure to the sun. Polysianes SPF30 from Klorane provides a bright, radiant tan. After a lazy leisurely day, treat your hair with after-sun shampoo with gorgeous sunny fragrances to prolong that wonderful summer feeling. These shampoos nourish your hair and remove UV filter residues like salt and chlorine thanks to their non-sulphate, monoi oil or calendula oil formula to clean your hair without drying it out. After washing your hair, don't forget about our suncare ritual - an after-sun reparative treatment mask. It repairs and nourishes your hair from the root to the tip. • After your shampoo wash, apply the mask to your dried hair. • Ensure that your hair is untangled. • Leave the mask on, wrapped in a warm towel for 15 to 30 minutes, according to your hair type. • Rince thoroughly with water to close your hair cuticles and give your hair a radiant shine. Take the time to care for your hair and relax while it repairs! For best results, leave you shampoo to rest for 1 to 2 minutes, massage to relax your scalp and activate micro circulation. Repairing after-sun shampoo. Rich in Calendula oil. To nourish and repair your skin and hair after exposure to the sun or sea. To continue to shine from the beach to the city and keep your beach hair beauty for longer, have a look at our summer style treatments. 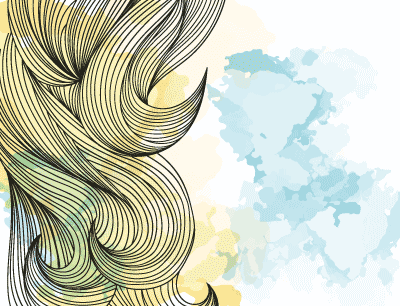 In the beginning, the sun and salty air give your hair a beautiful, bright and golden radiance. What is happening is that salt is slightly acidic and tends to open up your hair cuticles, making them lighter. To get the best result, discover our lightening sprays with camomile, lemon and honey. These actives are natural lighteners thanks to their pigment or peroxide content. Honey is also an excellent remedy for dry hair. Your hair will become brighter with sparkling highlights! Our Tip: Apply the spray along alternating streaks of hair for different blonde tones for a natural look. Hop aboard to ride the latest trend this season. Make your hair wavy this summer for the best beach look! For that wavy look, give your hair some texture with salt or salty water (for that beachy feel), boiling water and vegetal oil (argan, coconut etc.) 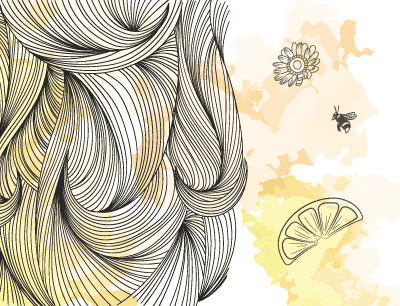 to nourish your hair. Spray a mix of these along your wet hair and twist strips of your hair together. For a more fierce styling, tousle your hair about with your fingers. There's nothing like a bit of bargain DIY beauty! You can also use wet-look sprays for that out-of-the-shower sporty and sophisticated look. Our Tip: To keep your hair in check at the beach, plaits are now back in style and will accentuate your flowing waves while avoiding that whole detangling ordeal. Lastly, to show off and make your hair really shine, use non-rinse oils every morning or after brushing. Oils are composed of fatty acids giving them nourishing and radiant properties. They also relax and protect your hair. Apply monoi oil once per week to rehydrate your hair from the root to the tip. Tiara flower oil to hydrate, nourish and radiate the skin. After sun spray that repairs, hydrates and nourishes hair. Draws out the shine and cares for all hair types. Moisturising, rinse-free, after-sun spray for sensitised hair. A long-lasting fix for wet hair. Composed of vitamin E and Cakile.